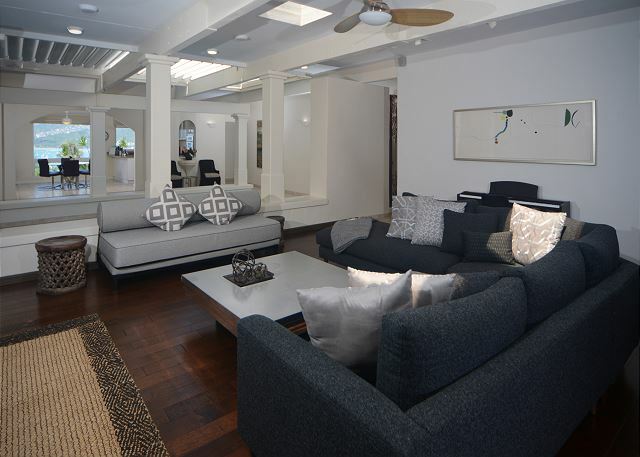 This stylish Honolulu home features endless views of the Pacific, a solar heated salt water pool, and contemporary interior design. 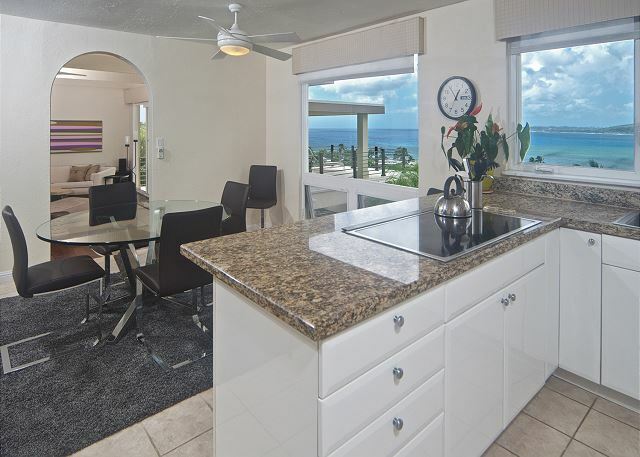 The Sky House has three bedrooms, four bathrooms, a fully stocked kitchen, and a spacious covered sundeck. 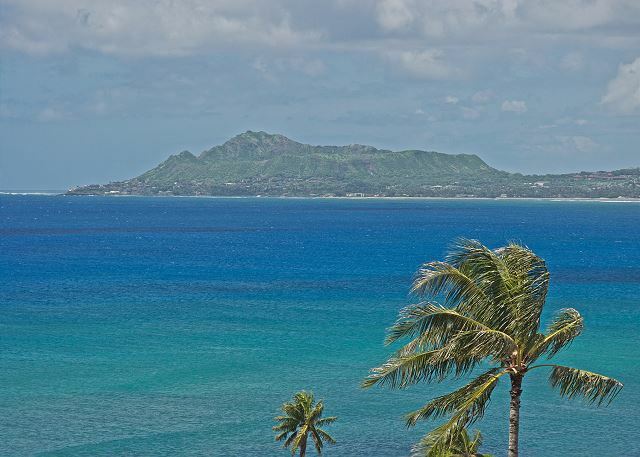 Most rooms have incredible views of the ocean, sunsets, and Diamond Head. 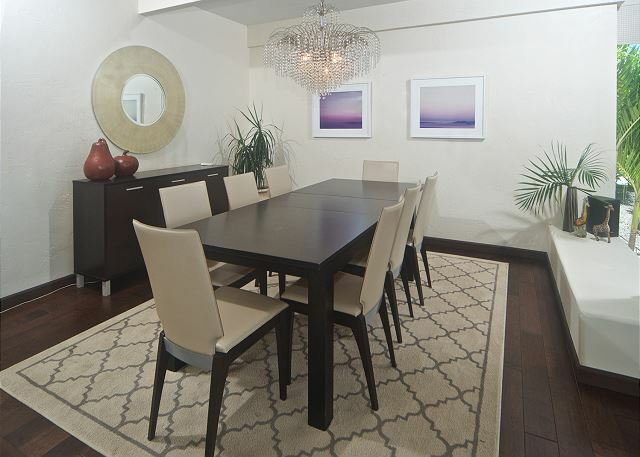 Other features include a formal dining area, two living rooms, and two outdoor areas for dining and relaxing. 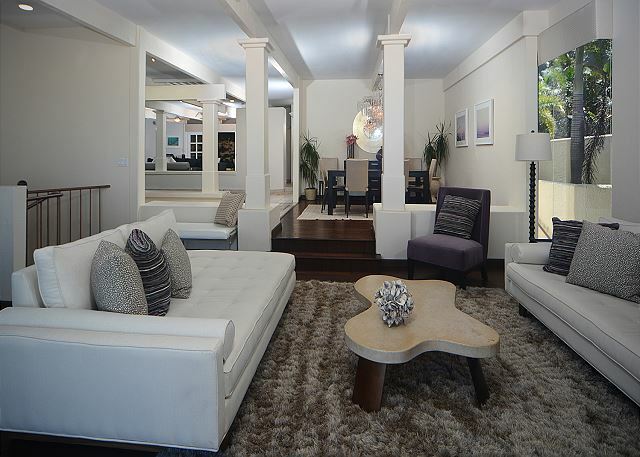 Sky House has a/c in all bedrooms, high speed wi-fi, off street parking, bbq grill, poolside wet bar and laundry room. 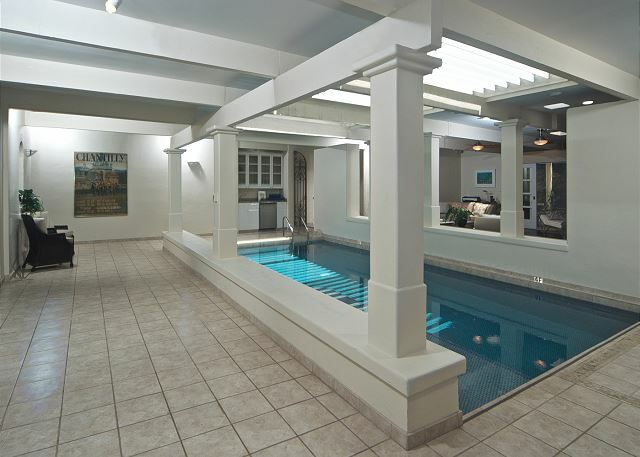 The pool does not have a fence around it so the home is not recommended for small children. This is a private house, no other home, tenant or caretaker is on this property. 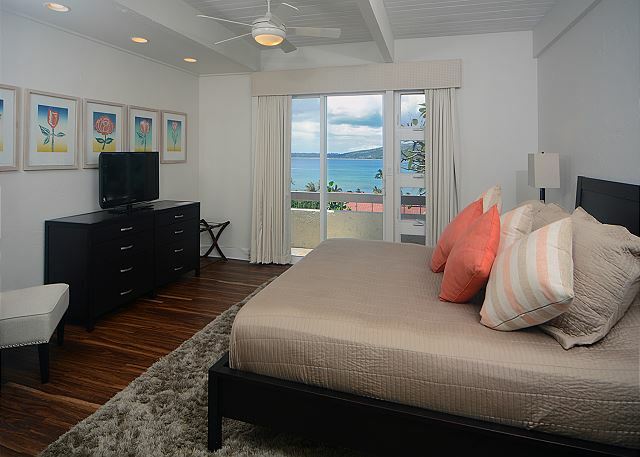 The home sleeps a total of 8 guests, please see below for a detailed description of beds. Please note bed for 7th and 8th person are futons or the sofa. 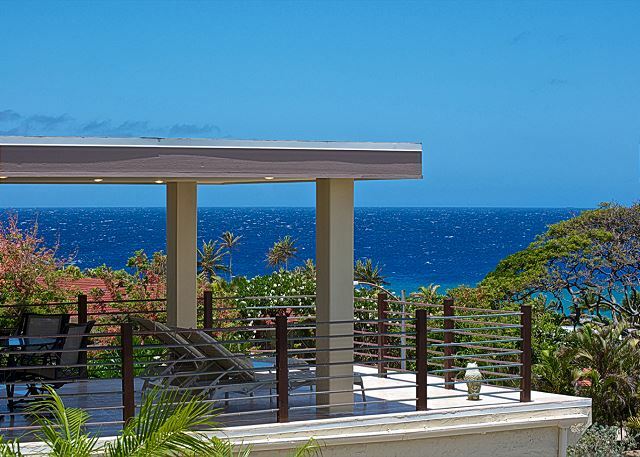 Sky House is close to a number of beaches and surf breaks, while famous Haunama Bay is practically in the back yard. 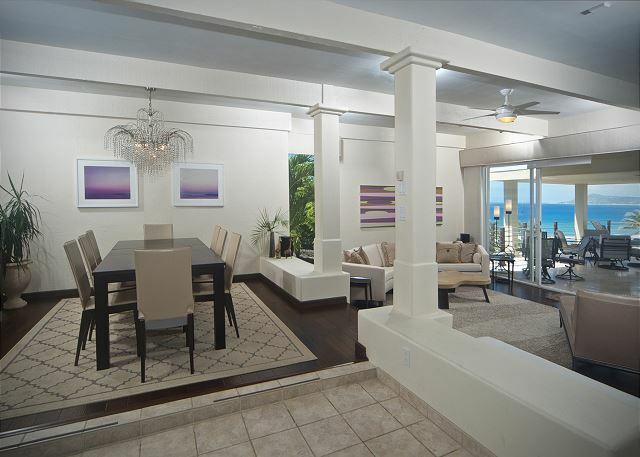 The home is in walking distance to various beach access paths, these lead to small sandy beaches or seaside cliffs. Spitting Cave and China Walls are both located in this neighborhood. One mile from the house is one of the most beautiful coastal roads in Hawaii. Along its shores you will find spots for whale watching, tide pools, Sandy Beach, and Makapua Beach & Lighthouse. 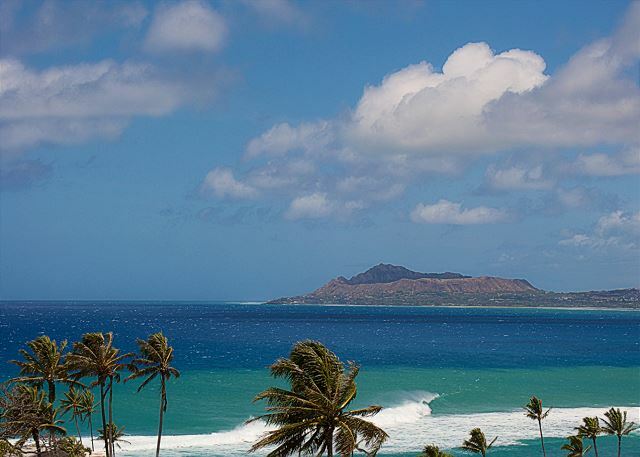 The scenic drive ends at gorgeous Waimanalo Beach, a local favorite that has miles of soft sand and excellent swimming. All of the above are within 8 miles of your front door. 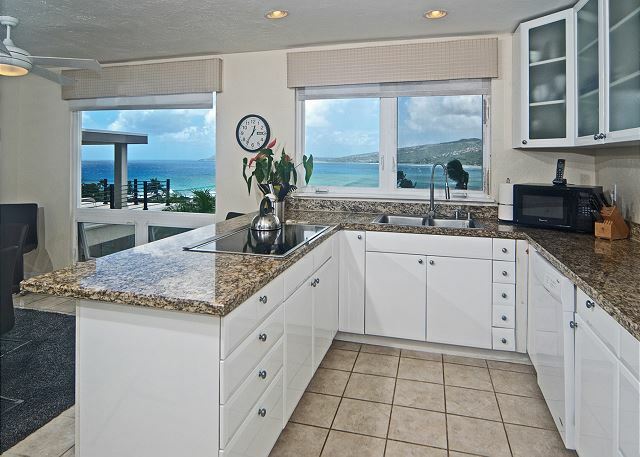 Sky House is located in the Portlock community, one of the most exclusive areas on the island. 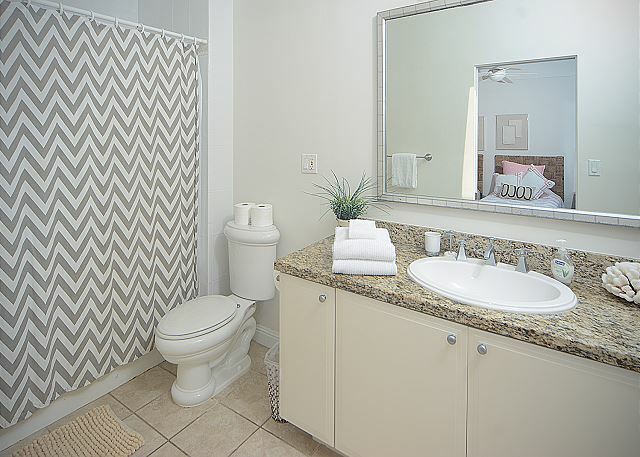 Portlock is in the eastern side of Honolulu and the neighborhood is very safe and family friendly. Nearby you will find plenty of grocery stores, including Whole Foods and Costco, drug stores, casual restaurants, upscale dining and boutiques. 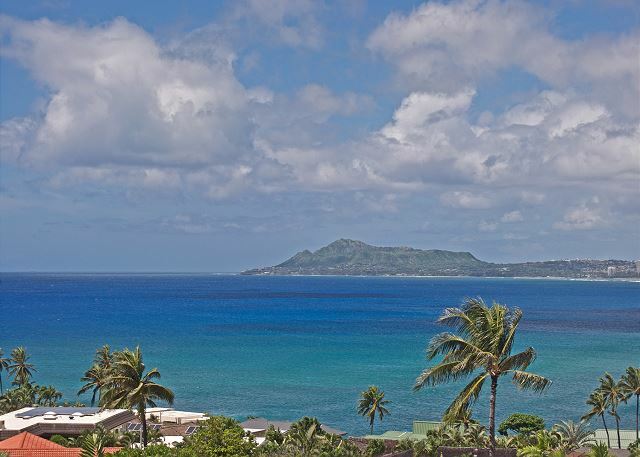 Haunama Bay is nearby for snorkeling, other close-by activities include hiking, parasailing, jet skiing, hang gliding, and golfing. The home is located close to major highway access for day trips. Waikiki is 9 miles away, the airport is 17 miles, and Pearl Harbor 34. Other: Sleeper sofa in living room for 7th or 8th guests. 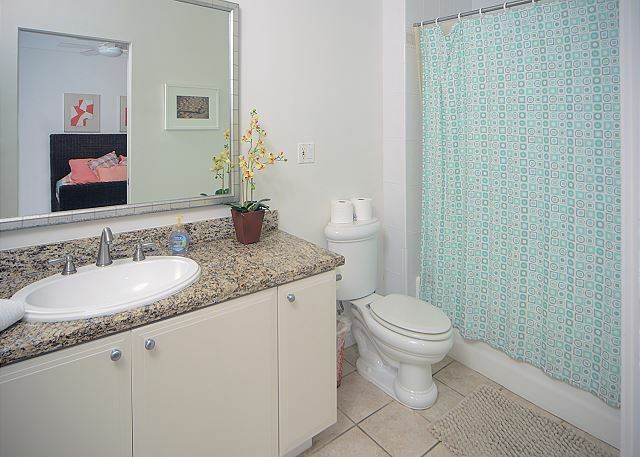 The fourth bathroom is a half bath. Things to note: There is covered parking for two cars. The garage is not available for guest use. AC in bedrooms only; fans throughout home. 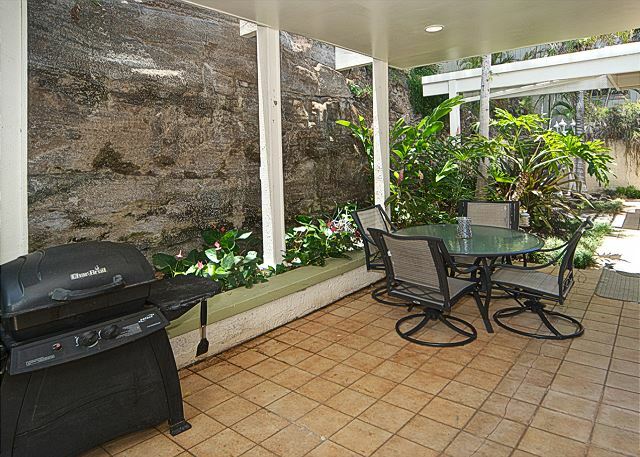 RATES: $595 - $995 per nt up to 6,$35 per additional guest. We all had a great experience at the Sky House during our 7 day vacation. It had great views and was located in a great place. We did have one problem that was not solved. The refrigerator's ice machine was broken and the refrigerator leaked water. I reported it the first day and second day of our stay; however, nothing was done to correct the problem. That was the only problem. Our Dental team had a great experience at the Sky House. The setting was excellent the views awesome. It would be nice in the description of the house to list what is actually there. ( hair dryer, bike, beach toys, soap, shampoo. Very spacious! Pool was nice to have to swim on our schedule and not worry about too much sun. It was solar heated via the open roof. So, a little cool. 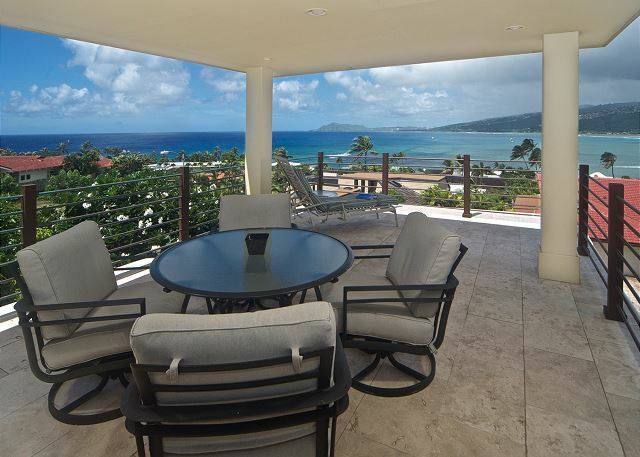 The lanai was nice to eat breakfast on or watch the beautiful sunset! Kitchen was missing some items needed to cook with. Main space is naturally air conditioned. A few fans were not working. Thank goodness for bedroom air conditioners. We had a couple humid days. Super steep driveway! Had to drive to a beach. Enjoyed relaxing in this quiet neighborhood. The house was perfect inside and outside. The housing company very friendly and helpful about everything. The only thing is the drive way is pretty steep for an up hill. Incrediable Views of the Ocean! Beautiful views of the Ocean! Each bedroom has its own A/C unit thank goodness because the house itself does not have A/C. However, the breeze was good enough for November. When at the home, we mostly spent our time on the covered patio that had crazy awesome views! We never used the pool because it was quite chilly for us Floridians. This was a birthday trip for myself & two other guy friends of mine. The house was amazing. Location was to die for. Plenty of room for lots of ppl even though it was only 3 of us. The pool & view from the balcony was the highlight of the property. 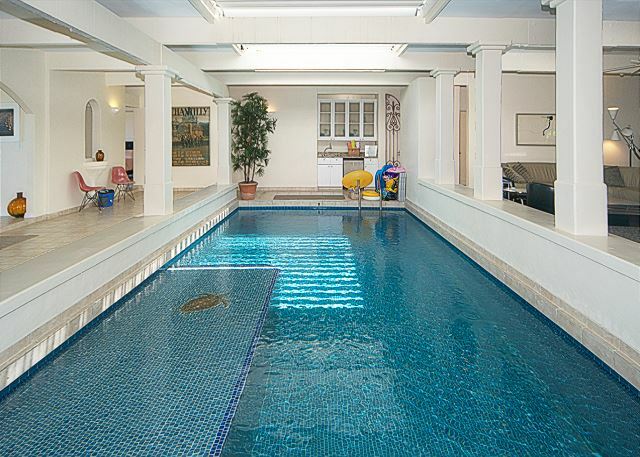 I wish the pool was ACTUALLY heated like stated in the description of the property. And other than the geckos everywhere but mostly outside thank goodness. We felt at home and very comfortable. I would definitely rent this place again and refer it to someone else. Manager Response: Happy Birthday! The pool is definitely heated! We will add written instructions in the house itself to avoid this confusion in the future.